This a traditional Ecuadorian recipe. So unexpected but super delicious! 2Finely grate the plantain. Soak the grated plantain in the shrimp water. Set aside. 3Dice onion and pepper. Mince garlic. Add to a pan over med high heat with cumin, paprika, and achiote. Add salt and pepper. Cook until onions are translucent. 4Add plantains to the onion mixture. Add peanut butter. Stir until well combined. Cover mixture with water from shrimp. Bring to a boil then reduce the heat. Simmer until plantain is soft and the mixture is uniform (should be a yellow brown color). 5Remove from heat. Add in shrimp and cilantro. Stir to combine. 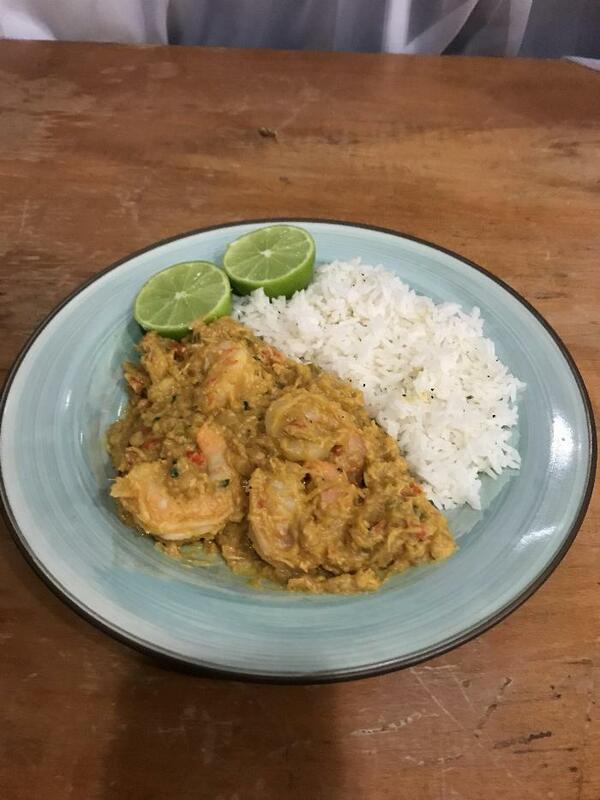 6Serve with juice of half a lime and rice. Enjoy! After grating the plantain, it can be soaked in the water from the shrimp boil to add a little extra flavor. Use the same water later when combining all the ingredients.